It is possible to cycle the Loch Lomond & Cowal Way. We have many cyclists who have completed the Loch Lomond & Cowal Way, some in one day! You will be able to cycle between 85% and 95% of the path, depending on your fitness levels, cycling abilities, conditions underfoot and what pack, if any, you are carrying. 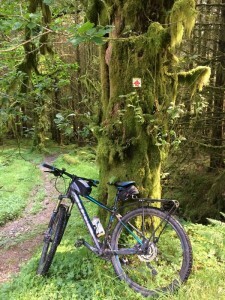 For example, between Tighnabruaich and Glendaruel there is small part where you will have to push your bike along the beach, and also a short section in the woods where you will have to carry your bike. The good news is that there are no stiles on the Way; they have all been replaced with two-way swing gates. If you follow the link below it will take you to a report drafted by a cyclist and long distance path enthusiast, who completed the Loch Lomond & Cowal Way in July 2017. He took 2 days. Hopefully his experience will be helpful to other cyclists wishing to visit the Loch Lomond & Cowal Way. If you would like a route that you can do in one day, try the Ardgartan to Inveruglas section. You can park your vehicle at Ardgartan picnic site (coming from Glasgow, a few km past Arrochar on the left hand side), and cycle to Inveruglas. This is about 5km and consists of forest track and quiet road. Another good route, this one for cross bikes as well as mountain bikes, is the Glendaruel to Strachur section. It is just over 15 miles and includes quiet farm roads and forest tracks.